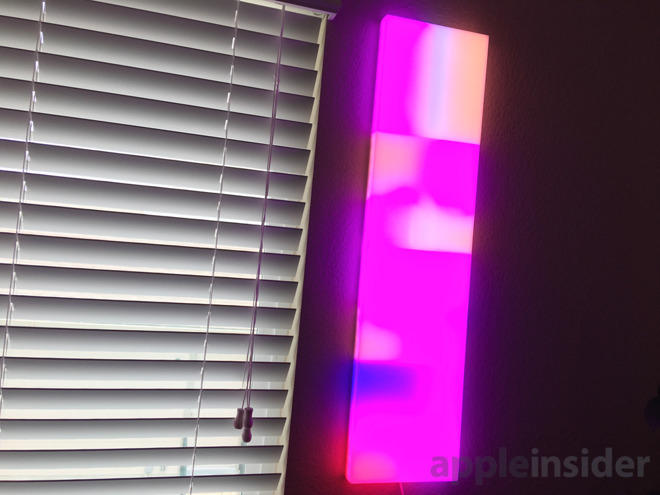 Having recently reviewed the Beam, we thought we'd take a look at LIFX's other recent entry into lights as decorations, the Tile. The Tile kit actually includes five tiles, plus connection and power cables, and adapters for international outlets. Each tile has 64 lighting zones which can dim and cycle between 16 million colors. As with the Beam, you can rearrange the kit into whatever pattern you like, in this case simply making sure a green-stickered tile is the one that connects to power and gets paired with HomeKit. The Tile kit is in some ways more flexible than the Beam, since beyond having more zones per unit, tiles don't have to touch directly. Instead they're connected via cables that stretch up to a few inches away from their neighbors. In fact we found it very, very difficult to make the tiles touch while still sitting flush against the wall. You have to curl up the cables into compartments while passing them through narrow slits, and by their nature the cables are liable to pop out in one place or another. Trying to do this while mounting tiles vertically (using included 3M adhesive strips) was extremely frustrating, and as it turns out, risky. We accidentally destroyed the tip of one of the connector cables even though we didn't think we'd applied that much pressure. 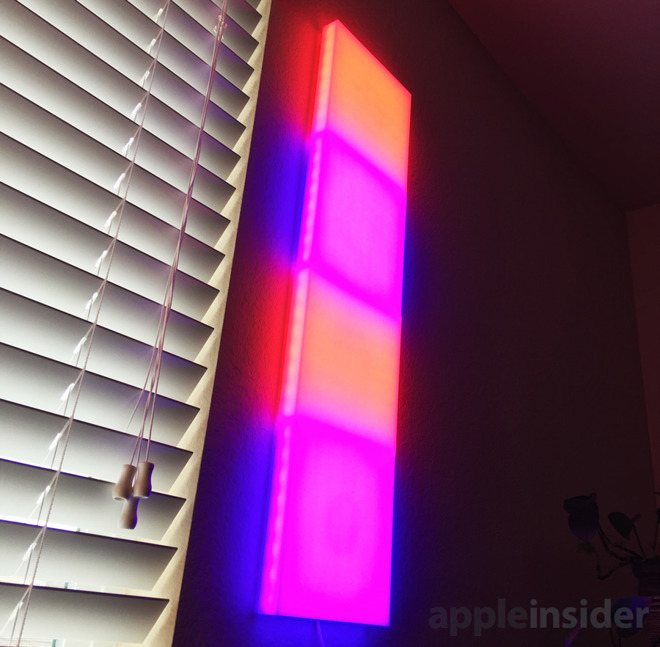 We'll go into greater depth with controls for our full review, but for now we'll note that you can use the LIFX app, HomeKit/Siri, Google Assistant, Amazon Alexa, and Microsoft Cortana. 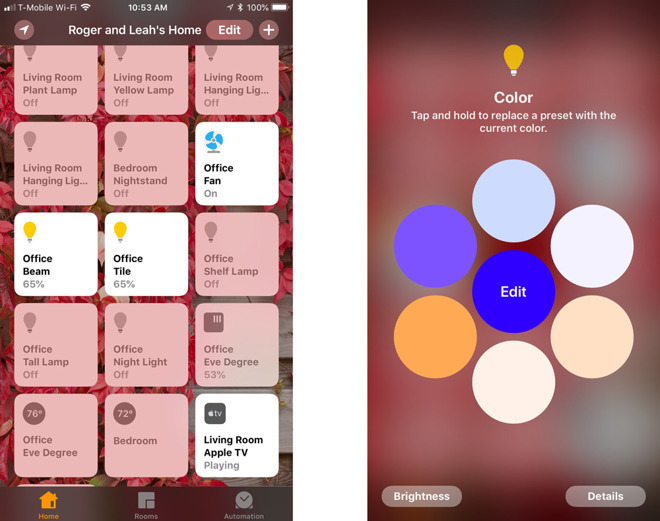 HomeKit compatibility includes support for scenes and automations, so you can for instance have the Tile turn on automatically when you get home from work. We were able to test the product with HomeKit and Alexa, but practically speaking neither assistant can take full advantage. Those platforms only let users assign a single color across all tiles, whereas the LIFX app enables complex color patterns and effects, and even lets you "paint" custom lighting. Keep tabs on AppleInsider for our upcoming review.